Move your organization towards equitable LGBTQ inclusion with the knowledge, systems and training to succeed. Egale endeavors to advance human rights based on sexual orientation and gender identity through research, education and community engagement. Egale offers private, public and not-for-profit sector organizations reliable, high-quality training and development for professional, management and organizational development on both a local and national scale. We aim to help clients develop the strategy, motivation and accountability required to foster LGBT inclusion and safer space. Grounded in anti-racism and anti-oppression principles and practices, the Egale training & facilitation includes an evidenced-based, intersectional, systemic, organizational and human rights based approach to training design and delivery in LGBTQ inclusion. Egale promotes and fosters the human rights and equitable inclusion of lesbian, gay, bisexual, trans and two-spirit (LGBT) people in community, schools, and work through consultation, programs and services, training & development and community engagement. We provide reliable, high-quality training and development for professional, management and organizational development on both a local, national and international scale. Egale training and facilitation aims to build participants’ knowledge, skills, attitudes and abilities in LGBTQ inclusion and fostering safer and accepting spaces. Using adult learning principles. Use case scenarios and activities for applied learning. 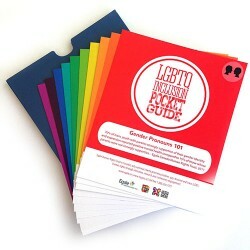 This three hour presentation provides participants with a general understanding of lesbian, gay, bisexual,transgender and queer (LGBTQ) language and identities. It works through a series of discussion based activities designed to identify and examine the barriers to inclusion within society, their work places, and within their own lives. This three hour session is tailored for lead volunteers, organizers, board members, and managers. Content includes advanced theory, organizational management, legislative compliance, and best practices. In addition, advanced sessions can include case study examinations and high-level problem solving. This full day session will increase participant’s knowledge of trans identities and trans-specific issues and accommodation and requirements. Egale can help your organization identify gaps in LGBTQ inclusion knowledge, skill and practices through anassessment of staff, programs and services. Guided by the results, our skilled team can help develop best practices to enhance LGBTQ inclusion and safer space. Are your policies compliant with legislation and reflect your commitment to inclusion? Egale can review your organization policies, exploring the ethical issues that are tied to your values and increasing understanding among your stakeholders. Egale is available for consultation to support you in integrating LGBTQ inclusion knowledge, skills, policies in your work place, programs and services.